The 55th Governor of New York State has a permanence in the New York State Capital building, hanging in the Hall of Governors chronological timeline. 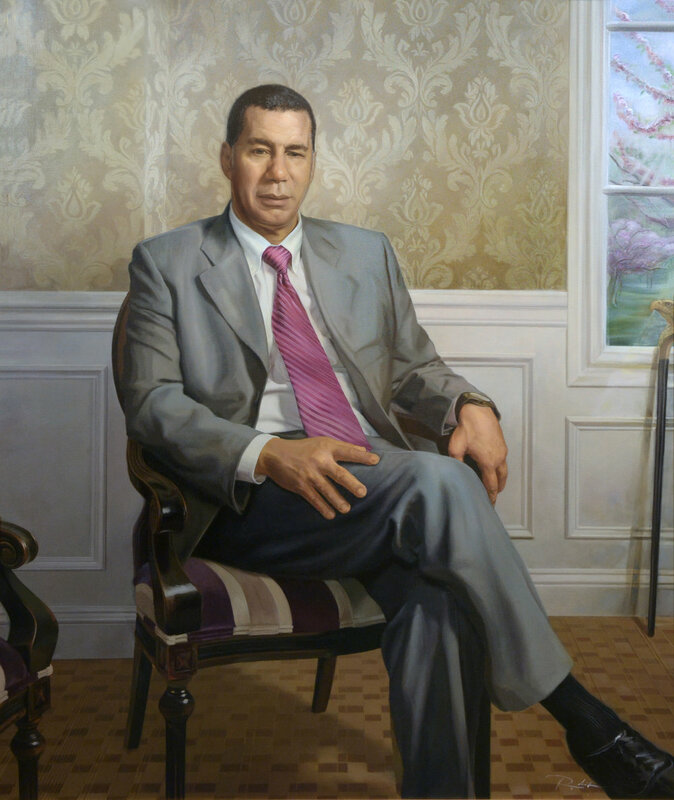 Portrait artist, Roger Derrick was truly honored to have been selected and worked closely with former Governor David Paterson. Collectively, subject and artist brought a shared vision to life in the continuing tradition of portraying New York State Officials. Derrick also had the privilege of meeting New York Governor, Andrew Cuomo, who acknowledged his painting in the opening address at the unveiling ceremony on March 2, 2014. "The intention of Governor Paterson's portrait goes beyond the mere likeness of this distinctly unique man, as we considered a range of possibilities from the onset. The inclusion of a conceptual undertone further added to an otherwise traditional narrative." "Alongside his predecessors, Mr. Paterson's portrait accompanies these fellow governors within the traditional fashion suited for the Hall's motif. As his inclusion into the Hall's chronological timeline was well anticipated, the portrait further invites the viewer to witness Governor Paterson as both the man and the messenger. More than a privilege, it was an honorable experience to work with such an individual." "Amidst the symbolism, the painting also depicts an adjacent cane topped with the head of an american eagle. Aside from the direct connection to Governors Paterson's personal message, the keen vision of our national bird is emblematic of this man's consciousness."